It started with renovations. An apartment, freshly purchased by a recent university graduate, needed some work. And as a digital native confused by the primitive methods that our forefathers used to hire tradespeople to do our renovations, Marcus Lim saw a market ripe for a digital transition. Like many successful tech startups, OneFlare is a digital offering aimed at bringing the processes of the 20th century into the ripe new, internet-enabled present. It's goals, its very reason for existence, is to add a layer of transparency between tradespeople and the general public. "What we're trying to do," Lim explained to TechRadar, "is we're trying to facilitate the transaction between two parties. We're not forcing or coercing anyone in regards to the message, but what we're trying to do is provide the most relevant and most competitive information to the consumers so they can make the best decision in regards to who they hire." What it comes down to, ultimately, is pricing and reputation. Before the age of the internet, hiring a tradie required something of a leap of faith - you found someone in the Yellow Pages and hoped they wouldn't drag your wallet over the coals. Or if you were lucky, you'd get a recommendation from a family or friend for someone trustworthy. OneFlare attempts to deliver all that information to you, including a realistic quote, before you even pick up the phone. OneFlare actually began life as a different site altogether. 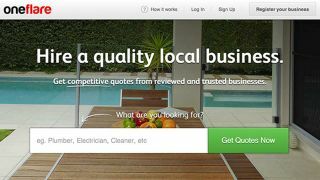 Dubbed pickaquote.com.au, the site was initially targeted at tradespeople exclusively. The name switch to OneFlare came as a way of incorporating other services into the platform. "The word 'quote' is very synonymous with trades and services. What we felt was if we were to progress to local services, then 'pickaquote' wouldn't be the right name because 'quote's' not synonymous with chiropractic services, or a massage services, or pet grooming… it's very synonymous to trades. So we changed to OneFlare," explained Lim. The other surprising aspect of the OneFlare business is that it's not exactly an original idea. Even when Lim and his business partner Adam Dong were getting started, competitors offering a similar service were already on the market. But the OneFlare team figured they could do a better job. "I looked at the founders of the competitors and I felt like they didn't have a technology background, so they weren't tech natives. The way they'd built the site and the way they came to present the value proposition to the customers weren't as appealing," Lim said. It was obviously a good justification, given that OneFlare has surpassed one of its competitors, in terms of both visitor traffic and jobs requested, within two short years. Not only that, Lim told TechRadar that they have already been approached by a competitor for acquisition (which they turned down flat), as well as being approached for lead-sharing with both of its major competitors. But for all that, there were still plenty of hurdles to overcome. One of the earliest challenges the startup faced was being able to build the site without a large amount of capital. "I was fortunate enough to have family and friends who knew how to code, so we originally brought them on and they built the site," Lim said. "The ongoing process was very difficult. It was a combination of being unable to find talent and also not having a lot of capital, so we couldn't go to an agency and say, 'hey, look, we're happy to pay a hundred grand a year for a developer' because we didn't have that. So we had to go to uni students, and it was a lot harder to find competent uni students who were able to develop continuously on the site."